Make your own minced garlic and freeze, then thaw in the fridge when you need minced garlic. I know some of you are total garlic purists who’d never use anything but freshly peeled and minced garlic, and those people won’t need this tip. I do use fresh garlic for any dish where I want that sharp garlic flavor, and love my little garlic chopper when I need to chop a lot quickly. But for lots of recipes, especially when the garlic is going to be simmered in a sauce, soup, or stew, I like the convenience of pre-peeled garlic cloves, or (gasp) even minced garlic in a jar. What I don’t like is paying too much money for little jars of minced garlic that only last a week or two, so I started making my own pre-minced garlic for the freezer. Here’s how I do it. 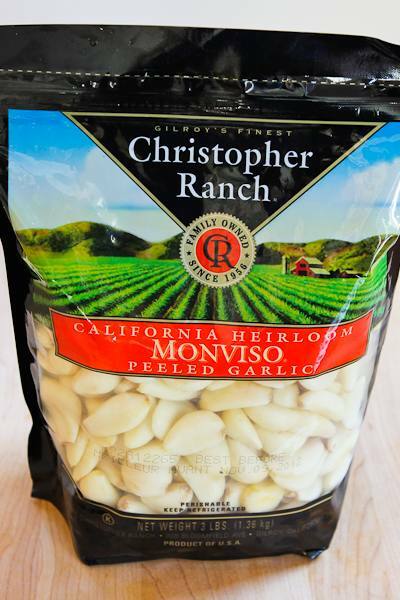 I’m a fan of these Christopher Ranch Garlic Cloves, and buy them at Costco where this huge bag is $4.99. (This product used to come in a jar.) I can’t use this big bag of garlic cloves before they start to go bad in the fridge, so I came up with the idea of mincing the garlic and freezing it. I cut open the bag and take out two cubes at a time, which I store in a little jar in the fridge. This frozen-and-thawed garlic will keep in the fridge for a little over a week, and I like the idea that it doesn’t have any preservatives, which the expensive jars of minced garlic often contain. If you have more tips for storing garlic, let us know about them in the comments! You can find more cooking tips or tips for freezing foods under the tab Cooking Tips at the top of the blog. All the kitchen gadgets mentioned in this post are things I purchased myself or received as a gift, and none of these companies know that I am mentioning their product on my blog. Another great way to store garlic, thank a lot 😀 So how long will the frozen minced garlic package last the freezer? I wouldn't keep it more than a few months. Possible to change the "printer friendly" option so that the photos are removed and we can just print the text? Most of my recipe posts do have a "printer-friendly recipe" that contains text only. I don't have one for this post because I consider this just a method, not really a recipe. But you could highlight text and move it into a document and then print if you don't think you'll remember how to do it. Sorry Amy, don't know what would make it last longer in the fridge. I don't think olive oil would help much, but I don't really know. Great idea to use mini muffin trays. When you take out two balls of frozen garlic, you can them in a jar with oil, they will keep in the refrigerator longer. I use mostly olive oil, but add avocado oil to make sure the oil does not freeze in the fridge (olive oil alone will freeze). Thanks for the tips Kalyn. what a great tip! this can be done with pesto as well, and soup stock, and basically a lot of stuff! Possibly even less expensive is to buy heads of garlic and peel them yourself. YouTube the video of peeling a head of garlic in less than one minute. Anyone can do this and it's fun! Fresh garlic without any mysterious additives! Mother Rimmy, I love, love, love my FoodSaver too. Glad you like the idea. My husband loves his Food Saver. What a terrific idea you have here. I hate chopping garlic! Mommy, I can't publish comments with links to products, even when they are just trying to be helpful (like yours.) If I allow those kinds of comments my blog gets over-run with spam commenters "advertising" things in the comments. Gwen, I do agree that the chopped garlic will only keep for a week or so when it's thawed (or if it's stored without freezing), which is sure why the add preservatives to the little jars of chopped garlic. I don't really know about how the health benefits are diminished, but I have no doubt that freshly chopped garlic is better. However, I eat so much garlic I'm definitely not worried, lol! Hi Kalyn, I'm a huge garlic lover and use it several times a week in large quantities I suppose you could call me a 'garlic purist' 😉 I don't like the jarred stuff because like you I rather enjoy the pungent taste of garlic. Also, I've always wondered how well the garlic keeps after it's been chopped. I'm worried that the benefits of chopped garlic would be lost after it's sat for some time. Allicin, as you probably know is the chemical which is released after crushing/mincing garlic. I believe it's health effects diminish after a length of time. I am loving the ideas, and Trader Joe's is finally coming to Utah so I guess I will have to try theirs! I've done this for years with my home-grown garlic – but what I do is freeze it in a thin enough layer so that I can just break off a piece and toss it in the pan. I do the same with my onions, and I also keep my bell and jalapeno peppers diced in meal-sized portions in the food saver bags. If I don't have to take the time to dice onions, garlic and peppers to prepare for dinner, I'm much more likely to cook something healthy! I like the idea of freezing the cloves whole, or first on a trays or ice cube tray as individual balls and then storing in the freezer in mason jars. We always freeze smelly foods in mason jars and have had no problems. I buy mine already frozen in cubes from Trader Joes! But I might have to try doing it myself sometime! Thanks for the tip! Teresa and Jeanette, hope you enjoy it! I bought the same big bag of garlic just last week and have been plowing my way through, but I do need to freeze some as there's no way I'll use it all before it goes bad. Great idea – going to do this tomorrow! Fantastic idea! We love garlic and put it in almost everything but it is time consuming. Most of the time I just chop it up by hand (I have broke 2 garlic presses in the past year). And only use the jarred garlic when in an absolute pinch (I don't like the price but like that it keeps so long). I'm going to pass this tip on to my daughter. Maybe when we are doing some of our freezer cooking in a couple weeks we can add this in! Nothing wrong with being a purist if you have the patience and time! Lydia, love the idea of freezing caramelized onions and roasted garlic paste. Noemptychairs, thanks for sharing that tip. Barbara, love having it on hand. mub, there is no garlic smell at all with the foodsaver bags. A tight sealing jar might also work. Do you find that the Food Saver bags keep your entire freezer from smelling like garlic? I did this awhile back but put it in Ziplocs and everytime I opened the freezer I was blasted with garlic! Oh my goodness, I literally just blogged today about how I always keep a jar of minced garlic in the fridge to save money on always buying it fresh and so I always have it to hand when throwing together a meal… This is the best next step!! Great idea, thank you! I don't know why I've never thought to do this. Great tip! I love the big bags of pre-peeled garlic from Costco and Sams. I put the whole bag in the freezer and then just pull out a clove or two as needed. The cloves are not wet, so they do not stick together in the freezer. Sometimes the brand available at Sam's Club still comes in the plastic jar and not bag. I have found that it is best to freeze the jar before opening the seal inside to keep your freezer from smelling like garlic. Once frozen, it doesn't smell as you open it. Awesome idea! I looove garlic, so will definitely be doing this to save some time. I've begun freezing my slow cooker caramelized onions as well as roasted garlic paste. There is nothing quite like having your own homemade on hand. Love this idea for minced garlic, too (and yes, I do use it in soups and stews). Count me among the purists. Nothing more fun that peeling and mincing garlic. usually the first thing I do in a recipe – Gets my head into the cooking real fast. Kelly, I think as long as it's not kept in the fridge too long, there is no more concern about botulism with this than with the cloves of garlic. Love hearing the ideas from other people. Freezing onions is a great idea, and I love the sound of frozen roasted garlic too. I bought two pounds of organic soft-neck garlic — the heads were as big as the palm of my hand, absolutely amazing! — and I oven-roasted it with a little olive oil, Kosher salt, and fresh-ground pepper. Usually when I oven-roast garlic, I just pop the cloves into a freezer bag, but after about 25 minutes in the oven, these cloves were the consistency of toothpaste. Glorious garlic toothpaste that I squeezed into ice cube trays and froze. (Okay, some went straight onto some fresh bread for immediate enjoyment…) Once they were well-frozen, I just popped the cubes into freezer bags. Great tip. Easy to do as well with my home grown garlic. I also do onions for the freezer. I saute the onions, cool them, separate like you did into little packets and freeze altogether in another freezer bag. Great for soups, meat and other. Thanks for sharing. I think this is a wonderful idea!! Thanks for the tip..
Now, let the botulism comments commence! !